Born in Ogidi, Eastern Nigeria, in 1966, Newton Aduaka moved to Lagos in 1970 after the Biafran War, and then to England in 1985. 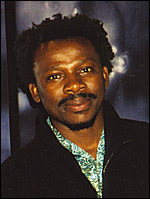 Following a diploma course in video arts and post-production, he studied film history, art and technique at the London International Film School , graduating in 1990. He wrote and published short stories while working as a sound mixer on a wide range of productions. In 1997 he set up Granite FilmWorks with Maria Elena L'Abbate to produce personal, cutting-edge and uncompromising films. As a director, his short films include Carnival of Silence (1994), Voices Behind the Wall (1990) and On The Edge (1997), which won him three prestigious awards and numerous special mentions. His debut feature Rage (2000) was released to huge critical acclaim, becoming the first independent film by a black film-maker to gain a national release in Britain. It was also very successful in international film festivals, winning many prizes including Best Director at the Pan African Film Festival in Los Angeles. Since then he has directed commercials and a further short film, Funeral (2002), commissioned for the Cannes Film Festival alongside similarly-themed work from internationally renowned directors such as Walter Salles , Arturo Ripstein and Amos Gitai .